With spring and summer comes “yummy” vegetables at stores and many roadside stands. As the book Henry and the Hidden Veggie Garden reminds us, it might take something special to get children to welcome this nutritious food into their diet. The story, written by actress Kimberly Williams-Paisley and her father Gurney Williams III, features a child named Henry who lives in the city. Henry enjoys video games, playing, riding his bike and pizza. Vegetables not so much. Even if they come with his pizza, Henry gets rid of them. His parents want him to eat these veggies. They keep encouraging him to try them, but realize it might take something more to make this happen. Henry’s mother comes up with the idea of sending him to his Aunt Sally’s home for the weekend. Aunt Sally lives far away from the city on a farm. Henry is not thrilled with the idea. Soon he is on his way to Aunt Sally’s to spend time with the family, including cousin Huck who is close to his age. From the world of the inner city to the farm is a huge adjustment for Henry. It’s an eye opener and the discovery of a secret veggie garden is a life-changer for him. Grants have been issued to over 80 schools via the program so they can start veggie bars and educational programs about nutrition. These healthy foods become an integral part of fighting child hunger. According to Feeding America nearly 17 million children suffer from hunger nationwide. They need school lunch and breakfast programs. With summer coming they need feeding programs to fill the gap with schools closed. When veggies are a part of this it makes children healthier and better able to learn and grow. Henry and the Hidden Veggie Garden is a great children’s story, but one also touching upon a very critical issue in America; ending child hunger through healthy eating. 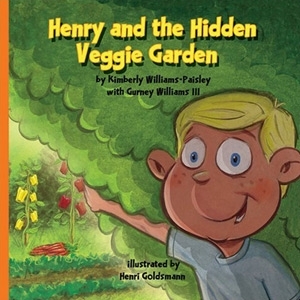 Article first published as Book Review: Henry and the Hidden Veggie Garden by Kimberly Williams-Paisley and Gurney Williams III on Blogcritics.